Don't you just love a great chocolate cake? Rich, chocolatey and moist? There are probably millions of chocolate cake recipes in the world but it seems that everybody has their "go to" recipe. This one is mine. It is perfect in its simplicity. Easy to make and even easier to eat! The beauty of it is that you can dress it up anyway you like. Here I have done it with a chocolate ganache on top with sprinkles and soft clouds of whipped cream in the middle. 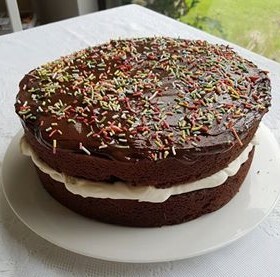 However, you could just as easily use a simple chocolate glace icing on top, or custard in the middle or even just a dusting of cocoa and icing sugar on top. You are only limited by your imagination. 185g unsalted butter. Diced and very soft. Grease and line 2 deep 20cm cake pans and preheat the oven to 160 degrees. 1. Place all ingredients in the CC jug with the kneading blade. 3. 30 seconds before the end of the programme, pause the machine and scrape down the sides of the jug. Continue the programme. 4. Once complete, divide the mixture evenly between the two tins (I always weigh my tins to make sure they are even). 5. Bake the cakes for 35-40 mins but check after 30 minutes. 6. Once cooked, remove from the oven and immediately turn out onto a cooling rack and allow to cool completely. 1. Break up the chocolate and place in the CC jug with the kneading blade. Blitz on turbo for around 30 seconds. 2. Add remaining ingredients to the jug. 3. Select Speed 5 Temperature 65 for 3 mins 30 seconds. 4. Check to make sure ganache is smooth. If not repeat step three for 30 seconds at a time until smooth. 5. Pour into a bowl and place in the fridge for 1/2 hour to cool and thicken to a spreadable consistency. To assemble: whip the 300ml of cream until thick. Cover one of the cakes with cream. Place the other cake on top and cover with ganache. Add sprinkles or chocolate shavings if you so desire.